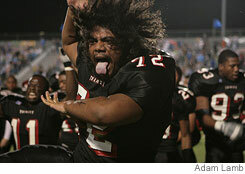 The Euless, TX, Trinity Trojan High School Football Team, the Tonga people, and the Haka. Today's WSJ on its front page has an article about the Trinity Trojans that will bring a lump to your throat and make you thankful (again) to be an American. If you go to the Trinity Football Website, you will find not only the WSJ article but also a video of the players performing the Haka. Otherwise, get yourself a copy of today's WSJ and read it. But be sure to view the video from the high school's football site that I link above.